cle’s Terracotta tile collection – shown here in Belgian Black Star and Cross. clé is pleased to introduce Terracotta, the new terracotta collection of tiles in Antique Terracotta Provincial Red and Belgian Black French Reproduction. 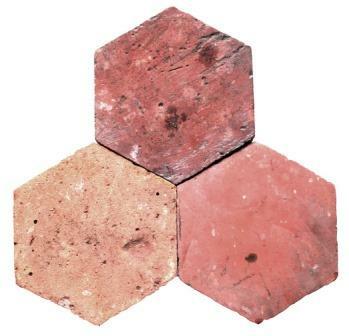 The Antique Terracotta tiles in a square or hex are salvaged from antique structures in France where they have graced buildings for over a century. Each tile is textured with the rustic passage of time. The Belgian Black French Reproduction tiles are hand-crafted in square, hex, star, and cross shapes by artisans who are working in the traditional method of terracotta production. Rather than use classic red terracotta, the tiles are created with blackened clay. Their chalky surfaces have an elegant patina of age, though they are modern reproductions. All of the tiles can be installed indoors and out, on floors and walls. Terracotta tiles are available exclusively on clé.